This seems about right. I like everything he does, but his operetta singing is the best. I'm having trouble deciding how to approach this writing. I have some very specific memories of this opera that I would like to share. This was Leontyne Price's second opera--Aida and then Forza--so I saw it live with her at the San Francisco Opera and on tv from the Met as part of her farewell from staged opera performances. Then I remember being a flunky in it in Germany, kneeling on the floor in excruciating pain. We performed it in German. We performed everything in German. Or should I talk about the table shown above? This table shows up in almost every scene with different numbers of chairs surrounding it. Each person is assigned a place even when they are not in their assigned chair. We presume that the chair with its back to us is for Don Alvaro who shows up late. The accidental shooting was well staged. This is usually confusing for the audience. In each scene there are different numbers of chairs around the table and different singers. Papa and the Padre are the same singer. In the next scene years later we see Don Carlo in his green sweater and glasses at first, and then he changes into military clothing. This is so we can follow who this is in the rest of the opera. The music is wonderful, but the opera is too long. You lose interest, or at least I do, when the soprano is missing for scene after scene. Pride of place in the bows and most enthusiasm in the applause went to Anja Harteros. Is it possible to explain her? Her voice is not beautiful, but it's beautiful enough. In most Verdi you are not really looking for beauty. Maria Callas' voice was also not beautiful. Nor is Sondra Radvanovsky's, Anja's only real rival today. I prefer Anja. For me she has more emotional range, draws me in to the scene more. 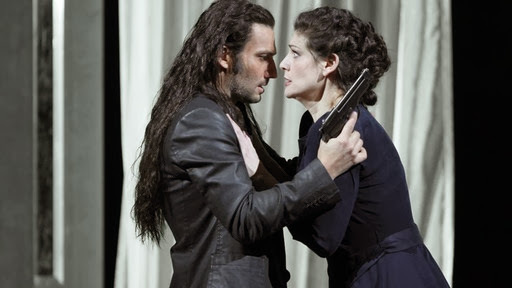 Kaufmann and Tézier are well matched. I can't help it, I want the duets to be with the soprano. She dies at the end with a pathetic lack of excitement. 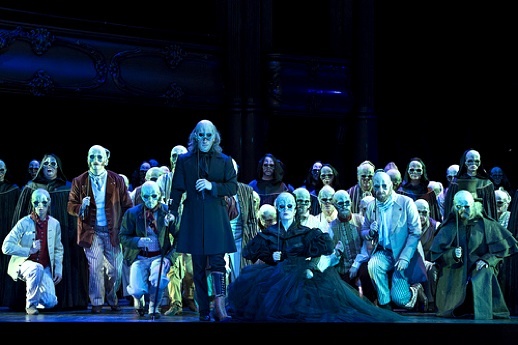 I used to blame the lack of popularity of this opera on the opening scene, but now I think it's the whole thing. It just doesn't work. I was viewing from a Mac in Ohio, and the stream was very jerky. I haven't had that problem at home. P.S. I didn't mind the production. This year was 200 years of both Giuseppe Verdi and Richard Wagner. The only Wagner of interest was the Met Parsifal. In sharp contrast I experienced quite a lot of great Verdi. Kaufmann and Harteros together brought me Il Trovatore, Don Carlo and La Forza del Destino. The Met brought me Rigoletto and a magnificent Falstaff. Kaufmann released Wagner albums and a Verdi album, Netrebko released a Verdi album. This was a truly great year for some other things, too. Jamie Barton won Cardiff Singer of the World. I also traveled to Salzburg for Norma. For another perspective on 2013 see KK Awards. (JK) (AH) Verdi-Il Trovatore from Munich with Harteros and Kaufmann ** This was heavily censored for the live stream so we missed the naked old woman who represented Azucena's mother. I still don't know why Leonora was blind. Live Stream. (JK)(AH) Verdi-La Forza del Destino from Munich with Harteros and Kaufmann ** The year ended with the last of the Kaufmann/Harteros trilogy in an opera I am tremendously fond of. Could we have more, please? Watching it again after all these years, I become convinced that the right production could save this opera. Live Stream. The singing prize is hard this year. 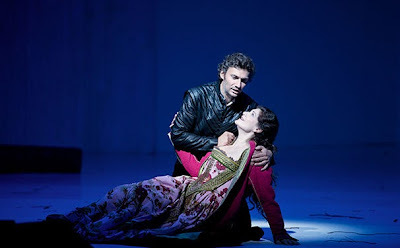 No offense, Cecilia, but I must award to Jonas Kaufmann and Anja Harteros for so much wonderful Verdi. Barber's Antony and Cleopatra was seen on YouTube. Glass' The Perfect American was a stream. Humperdinck's Königskinder was a DVD with Jonas Kaufmann. Rossini's La Donna del Lago was on YouTube from the ROH. Spontini's La Vestale was on YouTube. I don't remember hearing about this, but the National Endowment for the Arts opera honors list ceased after the 2011 award. They awarded for only 4 years. Or Forza as it's usually known--don't forget it streams on Dec 28. This picture makes me smile. I remember once long ago I was in Vienna and the newspaper said they were doing Die Macht des Schicksals. I puzzled over this for a long time. In those days the opera might have been performed in German. For more pictures see here. I was sent a link on my phone for this opera from the BSO--a first--which I can't find now in YT. There was a lot of talking in German. The regisseur compared Schicksal to Murphy's Law. You know: if it can go wrong, it will. This is sort of the programmer's motto. I find that it is Forza that I love. A brief chronological list of male opera roles sung from the beginning by women. The purpose of this seems to be to make the character seem youthful. Since I first posted this, it has acquired a few roles where the character is female but the singer is a man. The list isn't intended to be complete but instead tries to show how this spans all eras and nationalities of opera. Nicklausse in Conte d'Hoffmann is a special case, since the character represents both Hoffmann's female muse and male friend. There is another list at least this long of roles originally sung by castrati, but the date range is earlier. He is a giant man who does not require any padding to fully represent the magnificent Sir John Falstaff. His voice precisely fits the role. He can remain cheerful in the most horrendous of circumstances. He is Italian and has the native Italian's regard for Verdi. Ambrogio Maestri must surely have been born to play Falstaff. It was simply a joy to watch and hear him. He also brought risotto which you can find the recipe for on the Met website. However, we couldn't help reinterpreting the entire story from a much more Italian perspective. We weren't alive in England in Shakespeare's time, but we were more able to imagine the English wanting to take revenge on mere flirting than we were able to imagine Italians from the 1950s wanting it. Isn't this how an Italian man is expected to behave? Would Italian women be surprised or shocked by it? We think "yes" and "no" are the appropriate answers to these questions. 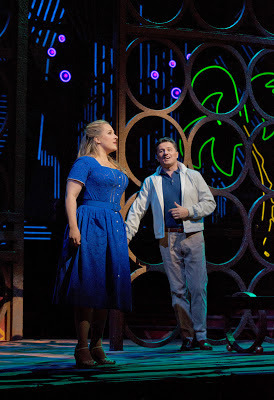 The Robert Carsen production for this Metropolitan Opera live in HD presentation moved the drama to the 1950s, we imagine because he could not resist the 50s clothing and kitchen styles. Falstaff visits Alice in her kitchen to allow for far more than linens to throw around the stage. (I bought this much more than I bought Ochs visiting Faninal in his kitchen here.) Sir John is a gentleman, and it is thought that gentlemen last enjoyed their full privileges while the British Empire was still in tact. I especially liked the opening scene. Sir John is reading the morning paper while still in bed and still in his night clothes. It is a large, significant bed, and round it are several small tables still covered with debris from last night's drunken party. With this setting we require no help making our way through the dialogue of the opening scene. All is clear as day. They read the list of expenses, and we see immediately that these are for the party. The only complaint is trivial--there was no oak tree in the final scene. Stephanie Blythe sang "Reverenza" exactly as Marilyn Horne would have done, and then tells us that her first performance of the opera was as Marilyn Horne's understudy. Era perfetto. Of my three Falstaffs this year, this was definitely the best. Everyone seemed to be having a wonderful time. Now that the Met has had such success with simulcasts into theaters, everyone wants to do it. The Tower Theater shows performances from the Royal Opera House in London, so I went down to catch Verdi's Les Vêpres siciliennes. This is a grand opera in French, one of Verdi's earliest ventures into the world of French opera. I kept listening to hear Verdi and really did not. It seems he was very much trying to sound French. There is a coloratura aria called Bolero near the end, the hit tune for this opera, but that was all I could hear of bel canto. 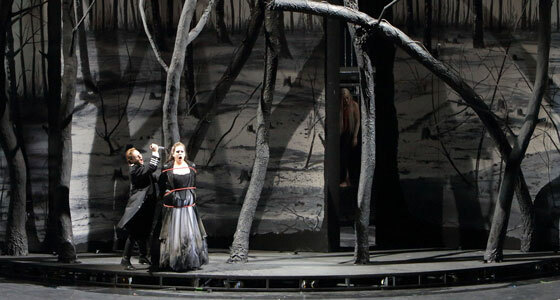 The setting has been moved from the historical event in 1282 to the 1850s period of Verdi's opera. It is common to stage an opera in the style of the date of its premier instead of what it says in the libretto, and I felt it worked fine here. The French and Italians seem to fight in almost every era. The production seemed to try to crowd as much on to the stage as it could possibly hold. There is the interior of the Paris Opera and the female part of the corps de ballet. There's scenic shots of Sicily. There's a very large chorus and a lot of supers. If you like everything in motion, you would love this. 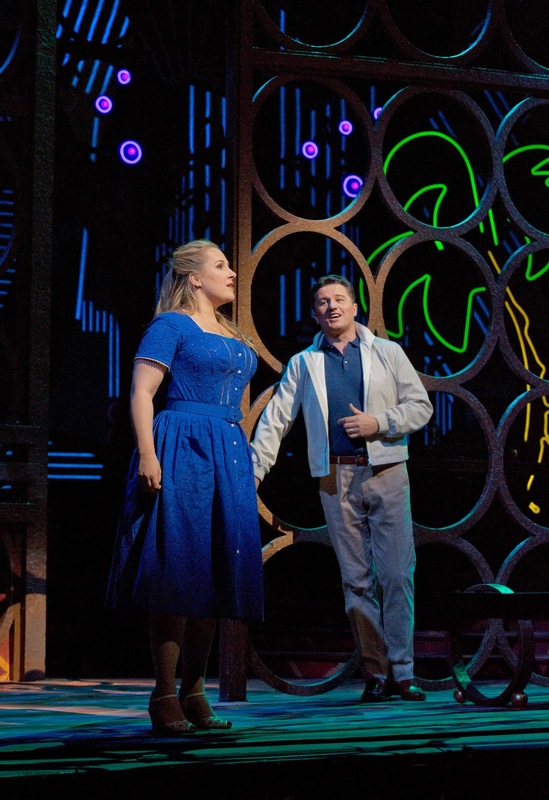 For instance, in the tenor and soprano love duet they constantly circle the chopping block, seeming to avoid instead of embrace each other. The ballet dances the prologue and various other scenes throughout the opera, but the traditional long ballet in act 3 was omitted. There is politics. France occupies Sicily, and the Sicilians make periodic attempts to throw them out. Procida is the most anti-French, along with Hélène whose brother was killed. She first enters holding her brother's head wrapped in a cloth. The whole production is like that. The governor rapes one of the dancers in the middle of the stage. People are shot. At the masked ball and other times, too, the masks are skulls held like lorgnettes. It is a dense, complicated, dark and violent opera made more so by the production. They spared us an actual massacre at the end. I went to see Erwin Schrott in a dress. It came near the end. Why he wore a dress in this scene remains a mystery, but he looked great in it. He also sang and acted very well. Next in order of impressive performances came Bryan Hymel. I think I was right about what I said about him here. With a bit of extra polish he could be a very impressive singer. The sound and picture quality at the Tower Theater in Sacramento were excellent. This is my first time for the French version. I saw the Italian version in San Francisco in 1993 with Carol Vaness and James Morris, and conducted by Charles Mackerras. I follow my musical loves wherever they may lead me, but despite whatever new loves I may acquire along the way, my deepest musical soul belongs only to the songs of Gustav Mahler. This recording of Lieder eines fahrenden Gesellen IV by Anne Sofie von Otter is simply unbelievably beautiful. She sings for me. "Sleep now, oh sleep now," "Sure on this shining night," and "Nocturne"
"Die Nacht," "Morgen" and "Cäcilie." I apologize for having a coughing fit in the middle of this group. I got out as fast as I could. My cough drops didn't work. Marietta's Lied from Korngold's Die tote Stadt. This piece is becoming common for me. Eternal Recurrence by Gregory Peebles. This is a piece written for Leah. "Con amores la mi madre," Del cabello mas sutil," and "Ciquitita la novia." "Have yourself a merry little Christmas" from Meet me in St. Louis. Leah has a voice of operatic proportions, and she chose pieces which suited both her voice and her musical loves. The music included classic American pop songs, including one done expertly in dialect. I'm seeing a lot of Obradors lately. The new cycle by Gregory Peebles would have been helped by printed text. We couldn't tell when the songs ended. I would describe the style of this group as post modern. She sang what she loves, and we loved it too. I went to a party on Thursday, and this recording came up. Jussi is probably the tenor I have listened to most in my life. He finds the emotion in the simplest possible way. This aria was also mentioned. Does anyone do it this slow? rück zu mir, mein treues Lieb. Come to me, my true love. bist mir Licht und Tag. You are my light and day. Hoffnung schwingt sich himmelwärts. Hope itself soars heavenward. Wie wahr, ein traurig Lied. How true, a sad song. das sterben muss. that must die. Ich kenne das Lied. I know the song. in schöneren Tagen. in better days. weiß ich sie noch? Do I know it still? Sterben trennt uns nicht. Death will not separate us. glaub, es gibt ein Auferstehn. Believe, there is an afterlife. We got into a lot of arguments--I don't hate regie, as you may have noticed, and don't hysterically adore Wagner--but it did make me curious to learn about Birtwistle. 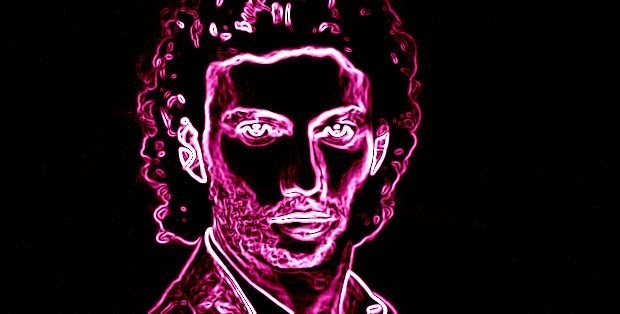 You may feel free to classify Neon Jonas with Eurotrash. La Forza del Destino streamed from Munich, again with Anja Harteros at the end of December, Conductor: Kirill Petrenko. This one didn't happen yet--the stream is on December 28. Wonderful operas, wonderful casts, widely varying conducting. Conducting ranked 1-4: Pappano, Gatti, Welser-Möst, Carignani. I felt that Il Trovatore was less than ideal for Harteros because the conductor chopped off her high notes by rushing on to the next thing. Performance overall ranked: Don Carlo, Fanciulla, Parsifal, Trovatore. The first three were my all time favorite versions for these operas, an amazing feat. 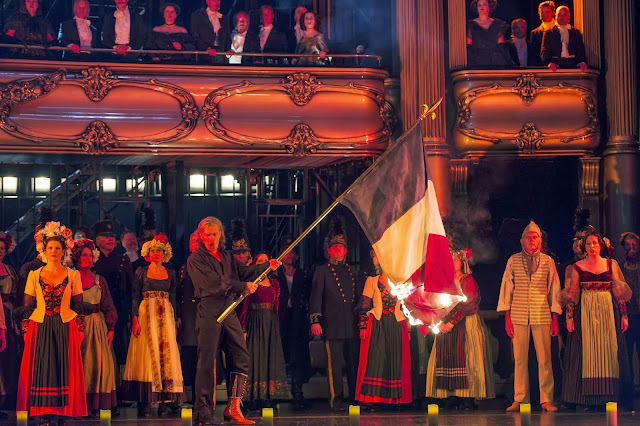 Trovatore had some flaws, including the weird production. As we move into the awards you are bound to notice certain repeats from the above list. To be eligible for an award a live performance must have taken place in 2013. 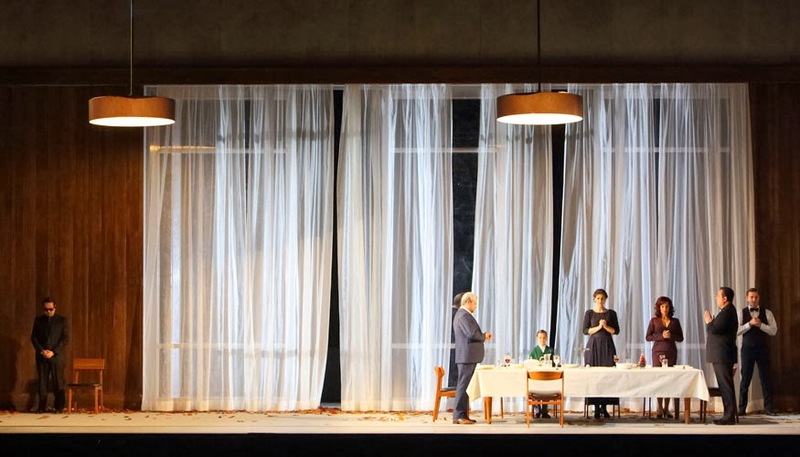 BEST VERDI OPERA AWARD is split to two awards: for production we award to the Metropolitan Opera's neon Rigoletto, while for music the award cannot help but go to the Salzburg Don Carlo. There was a lot of Verdi this year, but there was also some very high quality. BEST WAGNER OPERA AWARD must go to the Metropolitan Opera's Parsifal. I cannot indeed think of any Wagner performance I found superior. James Morris as Wotan. There are people who thought René Pape's Gurnemanz was boring, but for me it was exactly as I would have wanted it. BEST BAROQUE OPERA AWARD goes to the Metropolitan Opera's Julius Caesar, the Musical. This may be my last view of Natalie Dessay for a while. Her dancing was fabulous. I liked this opera best for David Daniels who made the character of Caesar really seem like someone who could conquer the world. In the constant search for ways to make the stagings of Handel operas seem interesting this one sets a standard. 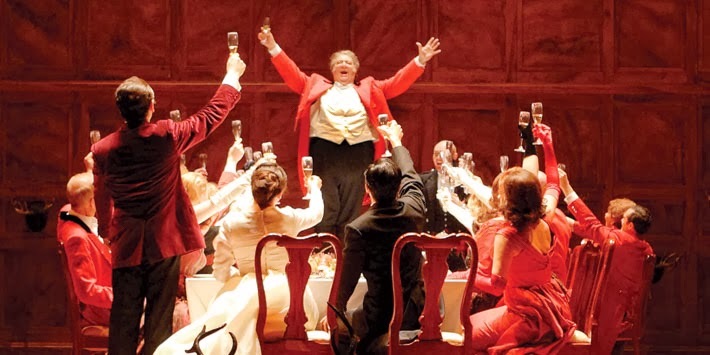 BEST ROMANTIC OPERA NOT VERDI OR WAGNER AWARD has quite a few entrants: Les Troyens, Francesca da Rimini and Eugene Onegin all from the Met, Les Conte d'Hoffmann and Mefistofele from San Francisco. For all its complexities I'm awarding to the very dark Les Conte d'Hoffmann with the Met's Les Troyens as a close runner up. That's a second award for Natalie Dessay. 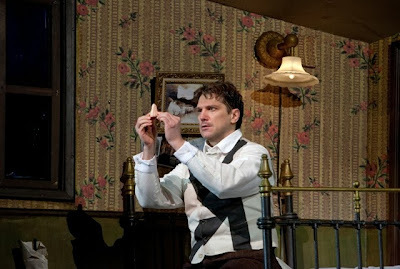 BEST REVIVAL OF A HISTORICAL MASTERPIECE AWARD goes to the Met's production of The Nose. I felt that the production itself rose almost to the level of a masterpiece and perfectly suited the opera. BEST MUSICOLOGY OUTCOME AWARD Musicology played a role in the American Bach Soloists' performance of the Bach St. John Passion, Les Conte d'Hoffmann and the Salzburg Norma. This means because of research into original performance practices, these works were presented in ways that were different from what the audience would be familiar with. I had a problem with the Bach Passion because this version of the score omitted my favorite part--the final glorious chorale. I award to Norma because it seemed to me that the complete transformation of this opera and the resulting re-emphasis on plot was significantly aided by the changes to the score. BEST TRANSFORMATION OF A FAMILIAR WORK INTO SOMETHING COMPLETELY DIFFERENT AWARD goes to Cecilia Bartoli's Norma from Salzburg with Julius Caesar, the Musical a close second. I very much enjoyed the film noir Norma with its increased realism. Pollione would leave Norma for a much younger woman, in opera terms a soubrette such as we see here, and not for the heavy mezzo we traditionally see. It's the only opera I traveled for this year. 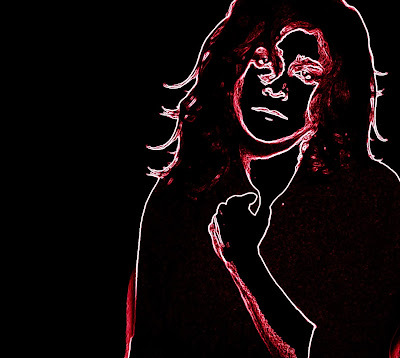 BEST ACTING IN AN OPERA AWARD goes to Cecilia Bartoli in Norma. I should award this category every year. Honorable mention goes to Nina Stemme in Fanciulla. BEST IMITATION OF ANNA MAGNANI EVER AWARD. This is obviously a one time award. BEST PUCCINI AWARD goes to Fanciulla from Vienna. There is hardly even any competition. People in the wilderness panning for gold don't really translate into factory workers, but the basic plot stayed in tact. For once all the singers were fully up to their roles. WORST EUROTRASH PRODUCTION AWARD goes to Il Trovatore from Munich. Other contestants in the running were Hippolyte et Aricie and Die Meistersinger, but they weren't bad enough to merit an award. Cupid popping out of an egg is just fun. I kept up my pace of new operas for 2013. I saw opera premiers for The Secret Garden by Nolan Gasser, The Gospel of Mary Magdalene by Mark Adamo and Dolores Claiborne by Tobias Picker, all presented by the San Francisco Opera. None of them were a complete bust, but I did not declare any masterpieces. Of these three I think I liked Dolores Claiborne best. Perhaps if I'd seen it later in the run, I would have liked it more. Other operas that were new for me were Spontini's La Vestale, Shostakovich's The Nose, Glass' The Perfect American, Humperdinck's Königskinder, Golijov's Ainadamar, Donizetti's Maria Stuarda, Barber's A Hand of Bridge, Rameau's Hippolyte et Aricie, Bucci's Sweet Betsy From Pike, Barab's A Game of Chance, and Barber's Antony and Cleopatra. BEST NEW (to me) OPERA AWARD goes to Golijov's Ainadamar from Opera Parallèle, a wonderful opera with dancing, singing and time travel. It was new in 2000, which is new enough. 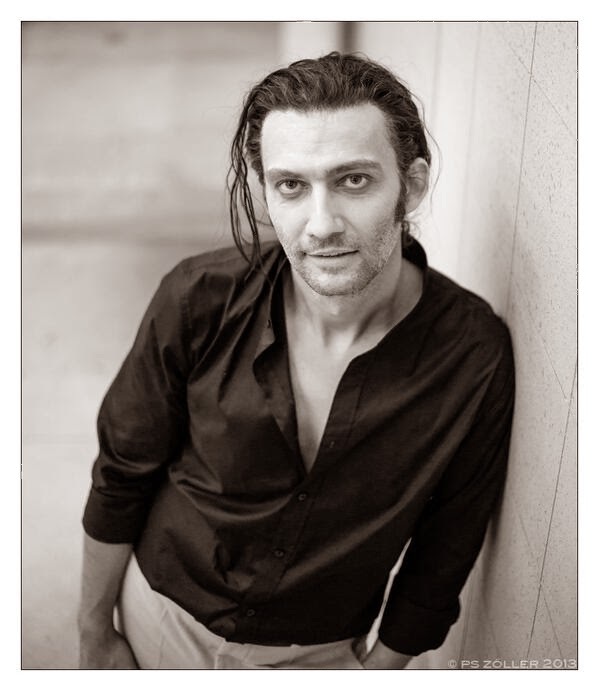 The Met has commissioned Golijov to produce another opera for them. It was a fabulous year for opera. These awards reflect only my taste. BEST FALSTAFF AWARD goes to the Met. It was both visually and musically extremely satisfying, in general an excellent performance for this difficult opera. I only added this because I saw 3 Falstaffs this year. It seems to some of the commenters on YT that Anja is deliberately trying to look like Cecilia Bartoli in this aria, though being 20 cm taller. Well. There is the hair, and the brow furrowing and other expressions. This is Cardiff which she won, so maybe it worked.